Last month I wrote about Sharpham Park and their campaign with Bowel Cancer UK to raise awareness and to encourage everyone to eat more fibre. I’ve been experimenting with spelt in my diet ever since and this pearled spelt based risotto has become a regular feature on our table. I am hugely keen on one-pot meals, less to wash up is always good, and this dish can largely be left unattended for the majority of the cooking time. It is also very flexible, and is perfect for using up all those fridge bottom vegetables. My fish was supplied Fish is the Dish who are currently running their Healthy Happy Hearts campaign to encourage everyone to get more omega 3 oils in their diet. Fish is a very easy way to do this, with just two portions a week providing enough omega 3s to make a difference. I’ve really enjoyed getting into a habit of eating more (sustainable) fish and seafood, and have been concentrating on some easy to make dishes, using fillets of fish so you do not have to worry about bones and filleting the fish yourself. I love using Japanese ingredients and flavourings in Western European dishes; it is fast becoming my signature style and I think it is well worth investing in the packet of miso and the nori or seaweed flakes needed to make this dish. 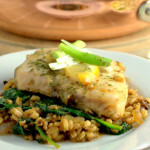 If you do not eat fish then try the spelt risotto topped with some fried tempeh or tofu. The fish I received from the Fish is the Dish campaign was delivered wrapped in plastic vacuum pouches, all ready for the freezer. Defrost overnight in the fridge, or drop into a large bowl of tepid water for about 40 minutes. 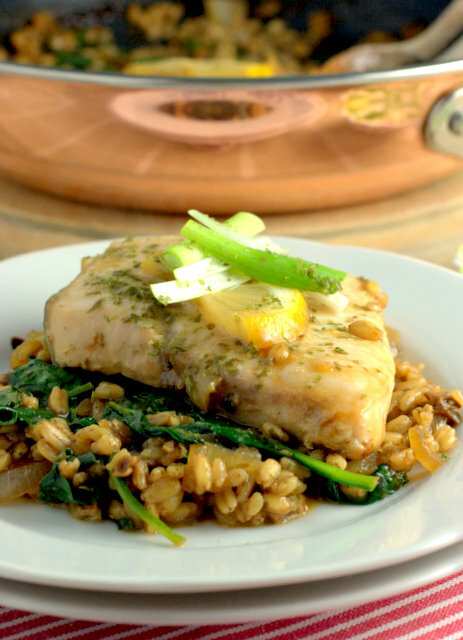 I used a meaty halibut fillet – one was more than enough for two – a single portion should be about the size of your hand – but any fish would work well here. By cooking your fish nestled in the speltotto you both preserve all the flavour and cook it very gently. Remove the skin just before serving. Of course you could use risotto rice in place of the spelt here. If you try this Recipe: One Pan Speltotto with Poached Fish please tag #FussFreeFlavours on Instagram or Twitter. It is amazing for me when for me when you make one of my recipes and I really do love to see them. You can also share it on my Facebook page. Please pin this recipe to Pinterest too! Thanks for reading Fuss Free Flavours! Heat the oil in a large non stick frying pan and fry the onion and garlic until just starting to go golden. Add the spelt and fry for another minute. Add the stock and wine (if using) and stir well. Allow to gently simmer for about 15 mins stirring from time to time, and adding more stock if needed. When the spelt is nearly done, but still al dente, stir in the miso, soy sauce. Add the spinach or kale and gently fold it in so it wilts. Make a well in the middle of the spelt mixture and lay the fish fillets into it. Gently cook for 5 minutes to poach the fish, adding more stock if needed, flip the fish over and cook until done, the halibut fillet took about 15 minutes in total. Add a generous squeeze of lemon, sprinkle the seaweed flakes over and serve immediately.